Yes, he thinks he is HAWT. He also thinks he is the KING. And he is completely deluded into his belief that he runs the house. And the car. And generally the world. Yes, he is, the typical MALE. Nuff said. So.... following the JD post where he is having fun at my expense and at Wendy's expense, we received lots of inquiries about JD's "table habits". We are going to answer those inquiries right here and now. JD eats all his meals at the dinner table. Yes. you read it correctly. JD does not eat his meals off the floor. He never has and he never will. He thinks food must be served on a table, with a proper place mat or tablecloth. He thinks that while silverware is not necessary, napkins are. 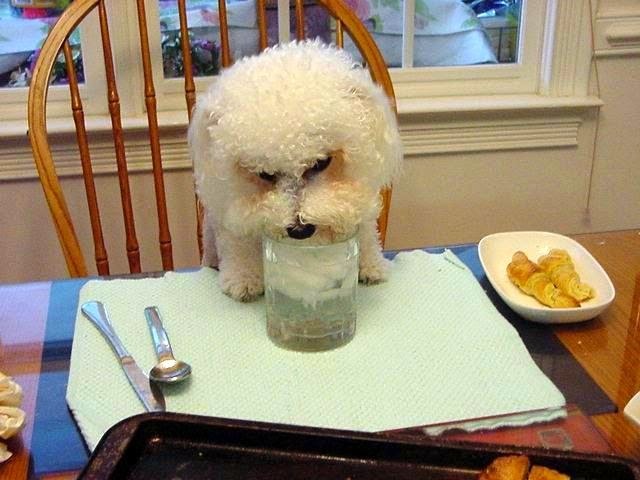 He likes to drink his water with ice from a glass. He occasionally will sip from a water bowl, but truly he is not into community bowls. He has his own plate, glass, bowl, cup, place mats and napkins. No. Momma did not do this. I promise you. It started way back in ancient times when JD was a mere puppy. 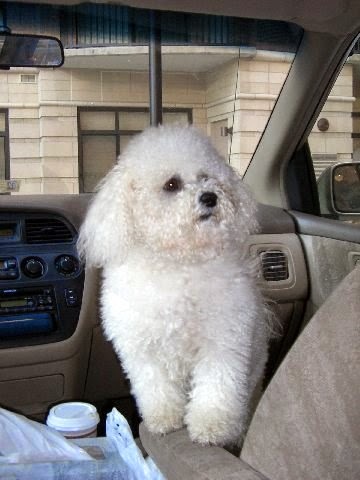 He was a very sick puppy and had deadly allergies that were interfering with his ability to eat. Once he was properly diagnosed, the boy was always starving, When momma would get dinner ready, he figured that his best bet at getting some food, was to be present and available at the dinner table where the rest of the family would gather to eat. [He is quite smart, you know] He also figured out that he needed to secure a seat to be at the dinner table. And that's when the "battles" started. He would refuse to leave the chair. he would stand with his paws on the table. JD is super stubborn...Frustrated and out of options, momma decided to keep the peace and look for a suitable chair for Mr JD. The bar stool was perfect. It gave him height, it was wide enough for his comfort [large cushion, you know it is all about the upholstery, kept his paws off the table and it was safe. Never, not once did momma think all this was weird. Know why? Because she is weird... and that observation is made with lots of love and respect. The woman has her priorities in the right place. It is all about her dogs! :) I love you momma. The ice ? Oh, JD likes his water with one or two ice cubes, no lemon, no lime, no cuke slices. When JD is hungry he hops on his bar stool. When momma is late getting dinner ready, JD lets her know. Oh yea, this boy has set ideas of what a proper table is. NO black, brown or red dishes! 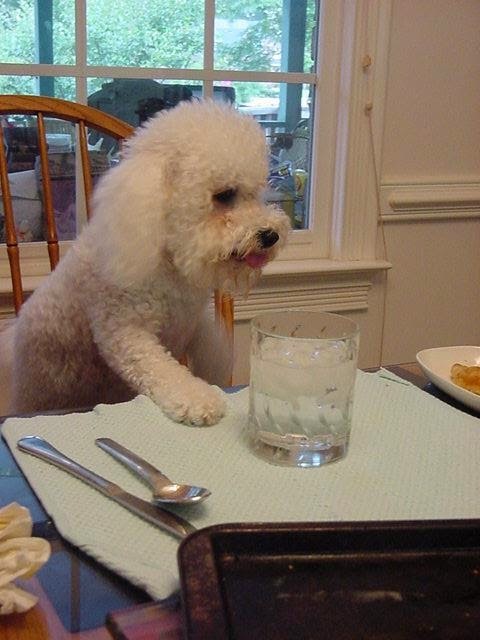 He like the classic white china and NO plastic glasses for him, His glass is cut Irish crystal. Don't touch his glass. Seriously. He will cut you. Also he has his own set of place mats. Use a fresh one each time. Nothing upsets him more than a dirty place mat. Yea, he is ... HIGH MAINTENANCE. Friends who come for dinner are a little shocked at first, and then... they get over it. Now, if you are being served crab, and you are seated neat JD, be prepared to hand over all your crab to Mr JD... because uncle Phil did and now, JD expects it. I bet you never knew how strange my JD is.... and this is only the tip of that iceberg. I better shut up. That boy has a long memory and I have to live with him.